Lester Bidston was a well-respected glove puppeteer, based on the Wirral, who performed mainly in the North of England from the 1950s to the 1980s. 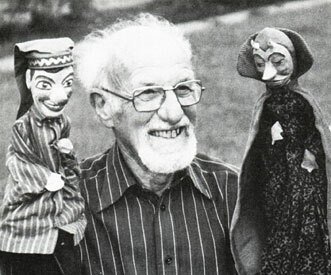 Lester first became interested in puppets in 1949, when, as a student at Didsbury College, he wrote and took part in a puppet play satirising life in the College. A professional engagement followed, in the form of a puppet play from Bulgaria, part of a Bulgarian Exhibition in London. 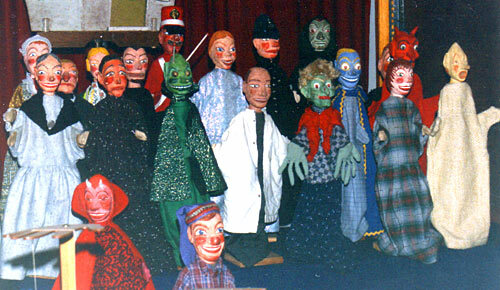 During the 1950s, while teaching in Germany, Lester spent a period of time with the Hohnsteiner Puppet Theatre, founded by Max Jacob and became greatly influenced by the Theatre’s work. He was particularly drawn to the character of Kasper, Mr Punch’s German counterpart and after many months of hard work, building a theatre, making and costuming a set of puppets, writing scripts etc, Kasper made his English debut as part of Lester’s ‘Peregrine Puppets’ in December 1959. Lester wrote all his own plays and built up a large repertoire of productions. At first, he worked on a part-time basis, until puppetry became his full time profession from 1968 onwards. He was helped at first by his wife, Edna, until her death in 1979. All the puppets’ heads were made from a type of paper pulp, which Lester invented himself. Sadly, the method of making this unique modelling material was never written down and is now lost. All of Lester Bidston’s puppets, staging and scenery were bequeathed to the Abbots Bromley Puppet Museum upon his death in April 1988 and a large selection of the figures now fill most of the upper display cases at the Puppet Museum’s new home, the Douglas Hayward Collection at Shugborough, Staffordshire.